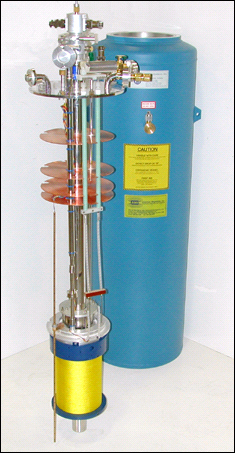 Many solid state physics experiments require the highest possible magnetic fields for high H/T or materials characterization measurements, particularly of superconductors. Using a combination of Nb3Sn and NbTi, fields up to 16 Tesla are now possible. A lambda point refrigerator can reduce the temperature to 2.2 K, while allowing refilling at atmospheric pressure. AMI manufactures both high field solenoid and split coil systems. The system shown here is integrated with a VTI and lambda plate refrigerator unit.